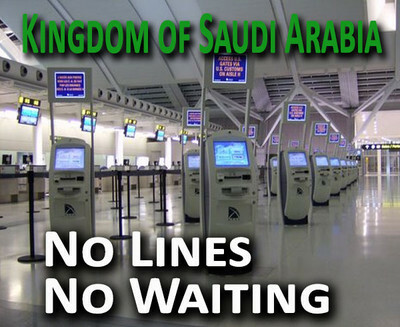 Special Travel Benefit for Saudis a "Slap in the Face"
An agreement to accept Saudi Arabian applicants into the Global Entry trusted traveler program drew little notice when it was announced in January. Now, some officials question why the country merits such a benefit – which is similar to a theme park "fast pass" to avoid long lines – when other allies like Germany and France are not yet included. A program for Israeli travelers was reached last May but has not been implemented. Homeland Security Secretary Janet Napolitano announced the agreement in January after meeting with Saudi Interior Minister Prince Mohammed bin Nayef. It "marks another major step forward in our partnership," Napolitano said at the time. "By enhancing collaboration with the Government of Saudi Arabia, we reaffirm our commitment to more effectively secure our two countries against evolving threats while facilitating legitimate trade and travel." Details about how the plan will work with the Saudis have not been released. Nayef's ministry, however, will be responsible for screening which applicants will be considered when the pilot program begins next year. It's not known whether the Saudi ministry will share its raw intelligence about applicants with its American counterparts. What is known, based on information provided by a Homeland Security source, is that each individual who makes it into the program will have been vetted by both the CBP and by the Saudi Interior Ministry against various databases. The Department of Homeland Security declined to make anyone available to answer questions about Saudi Arabia's inclusion in the Global Entry program after repeated requests throughout last week, and after indicating someone would provide more details. That is cause for concern, given lingering questions about possible Saudi support for some of the 9/11 hijackers and given the Ministry of Interior (MOI)'s inconsistent record on sharing its intelligence on suspected terrorists and terror financiers. Additionally, recent studies by the Department of Homeland Security (DHS) Office of the Inspector General (OIG) and the Government Accountability Office (GAO) identified significant problems in the way DHS components use computer systems and process intelligence for posting watch list lookouts and overseas screening of foreign nationals. A memo obtained by the Investigative Project on Terrorism said Saudi applicants "must meet the individual vetting criteria of both CBP and the MOI, and successfully complete vetting by each side against information available in various law enforcement, customs, immigration, criminal, intelligence, and terrorist databases." That doesn't bring confidence to those who have investigated Saudi Arabian connections to the 9/11 terrorist attacks. "I think you have radical Wahhabism in certain elements in Saudi Arabia, and I think to be more lenient there than in other places would be a mistake," Wolf said. "There were 15 [hijackers] from that country, and there is a lot taking place in that region. "Some of the people who went back to Saudi Arabia through Guantanamo – we find that they are in battlefields in Afghanistan or some other place, so I don't think it's a good idea." Saudis have long been known for withholding information from their American counterparts. Wolf recalls that the Saudis obstructed former FBI Director Louis Freeh's effort to investigate the 1996 Khobar Towers bombing by refusing to share information. "I think there has been a history of not cooperating," Wolf said. The Saudis paved the way for 9/11 by funding the madrassas along the Afghanistan-Pakistan border, which adds to Wolf's concern. "Adding KSA to the program before a full vetting of the Kingdom's involvement in 9/11 is very unwise," said Sharon Premoli, a 9/11 survivor who has sued the Saudis for allegedly helping finance the attacks. In sworn statements after 9/11, former Taliban intelligence chief Mohammed Khaksar said that in 1998 Prince Turki, chief of Saudi Arabia's General Intelligence Department (G.I.D. ), sealed a deal under which bin Laden agreed not to attack Saudi targets. In return, Saudi Arabia would provide funds and material assistance to the Taliban, not demand bin Laden's extradition, and not bring pressure to close down al-Qaeda training camps. Saudi businesses, meanwhile, would ensure that money also flowed directly to bin Laden. "They didn't tell us that," Premoli said in the interview. "They haven't been forthcoming on anything." Saudi officials deny that deal existed. The only way to find out is to continue investigating, Premoli said. She's perplexed that the brutal murder of 3,000 Americans even requires an effort to trigger additional investigation. "Let's vet them properly. Let's really declassify. Let's look at all of it. Until it is done, it's an open wound. It's an unanswered question." The Global Entry deal comes three years after U.S. officials briefly placed Saudi Arabia on a list of 14 countries whose travelers would face enhanced scrutiny when entering the United States. It followed Umar Farouk Abdulmutallab's failed attempt to bomb a Detroit-bound airliner on Christmas Day 2009. A cable sent from the American embassy to the State Department that was published by Wikileaks reported that Saudi government officials expressed "shock to be included on the list" and threatened to "to re-evaluate areas of cooperation, including counter-terrorism cooperation" if it was not rescinded. The policy was dropped three months later, replaced with a new program designed to use threat assessments and intelligence of traveler's behavioral traits and travel patterns. To Premoli, who is pushing legislation to strip sovereign immunity protection from governments tied to terrorist acts, both the removal of Saudi Arabia from that list and its addition to Global Entry show the country enjoys "favored nation status. It's so extraordinary that they are so protected." She was critical of the Bush administration for its warm relations with the Saudi royal family and is equally critical of the Obama administration for being "a continuation of the Bush administration." When the plaintiffs suing Saudi Arabia sought to appeal a decision absolving the Saudis to the Supreme Court, then-Solicitor General Elena Kagan filed an amicus brief siding with the Saudis. Saudi Arabian officials say all the investigations into the 9/11 attacks exonerated them of any involvement. But two former U.S. senators who led inquiries into the attacks say that's just not so. In affidavits submitted last year for plaintiffs suing the Saudis – including Premoli – former Nebraska Sen. Bob Kerrey and former Florida Sen. Bob Graham wrote that the book on Saudi Arabia's 9/11 connections should not be closed. The 9/11 Commission on which he served lacked the time and resources "to pursue all potentially relevant evidence" involving Saudi Arabia, Kerrey wrote. "Significant questions remain unanswered concerning the possible involvement of Saudi government institutions and actors in the financing and sponsorship of al Qaeda, and evidence relating to the plausible involvement of possible Saudi government agents in the September 11th Attacks has never been fully pursued," Kerrey wrote. "Based on my experiences as the Co-Chair of the Joint Inquiry, and the evidence collected by the Joint Inquiry during the course of its investigation into the events of September 11, 2001, the information contained in the Final Report of the 9/11 Commission, and reports and published material I have reviewed, I am convinced that there was a direct line between at least some of the terrorists who carried out the September 11th attacks and the government of Saudi Arabia," Graham wrote in his affidavit. That line may have come in the form of Omar al Bayoumi, a Saudi who befriended hijackers Nawaf al-Hazmi and Khalid al-Midhar. While the 9/11 Commission Report describes Bayoumi as "an unlikely candidate for clandestine involvement with Islamist extremists," Graham believes he was a Saudi government agent. Al-Bayoumi first met the hijackers in 2000, helped them find an apartment and "fronted the initial payments for that apartment" along with other financial help, Graham noted. "During the period that he assisted the hijackers, al-Bayoumi's allowances from a ghost job with a Saudi private firm and contractor with ties to the Saudi government increased eightfold. During that same period, Al-Bayoumi had an unusual number of telephone conversations with Saudi government officials in both Los Angeles and Washington." All this convinces him al-Bayoumi was a Saudi agent. "To this date, this evidence has not been fully explored and pursued, to the considerable detriment of the American public." In a column co-written with Premoli last fall, Graham said the classified chapter from the congressional inquiry focuses on the hijacker's financial support while they were in the United States. "Sadly," Graham and Premoli wrote, "those 28 pages represent only a fraction of the evidence of Saudi complicity that our government continues to shield from the public, under a flawed classification program which appears to be part of a systematic effort to protect Saudi Arabia from any real accountability for its actions." Abdulaziz al-Hijji, an executive with the Saudi government oil company Aramco, lived in Sarasota until just before the 9/11 attacks when he is reported to have suddenly left the U.S. Al-Hijji now lives in London. Recent media reports indicate al-Hijji met with 9/11 terror leader Mohamed Atta and current al-Qaida fugitive Adnan el-Shukrijumah while he lived in Sarasota. Graham has also looked into the al-Hijji matter and reportedly met with the FBI deputy director in November of 2011 and the deputy director refused to discuss the al-Hijji matter. Graham said, "I think that in the period immediately after 9/11 the FBI was under instructions from the Bush White House not to discuss anything that could be embarrassing to the Saudis." The ambiguity of Saudi Ministry of Interior's role is of particular concern, especially when it comes to who qualifies as a "low-risk traveler." Although individuals with defined al-Qaida ties likely would not get a pass, worries arise particularly when it comes to those who support Hamas or Hizballah. "I wouldn't trust them as far as I could throw them," Jim Phillips, senior research fellow for Middle Eastern affairs at the Heritage Foundation, said regarding the Saudi Interior Ministry. Although the Saudi Interior Ministry has largely decimated al-Qaida's infrastructure in the kingdom since 2003 in the wake of a series of bombings and killings of Westerners in the kingdom, Phillips says the ministry's reliability as a partner remains an open question. In an interview Tuesday, Graham reserved judgment on the program until more details are released on its implementation. He noted that the United States "went out of its way to placate the Saudis" after 9/11, arranging flights out of the country for Saudi nationals when all other air traffic was grounded, and waging "an effort to keep from public view the role of Saudis" in the 9/11 attacks. Including Saudi travelers in Global Entry may be "a continuation" of an American policy of deference toward Saudi Arabia. "The question is what was the first step in approving a country to be involved in this? What are the requirements?" Graham asked. "This is not a theoretical. This really happened that 15 Saudis came into the country, I think all by aviation … It would seem there would be some red flags." "It's a slap in the face," Premoli said. "Whatever they ask for, they get. There's nothing they can't have." What type of human are you ! Your article indicates the lack of your education, and you shouldn't have been allowed to publish this ridiculous article. The Saudis deserve this pass for many reasons. First, it is the most petrol supportive to your country, the United States. So, it is a valuable economic supporter to the United States. Also, responding to the fact that Saudi Arabia produced the 15 attackers of 9/11, Saudi Arabia neither produced that, nor adopted that. But, in reality, it considered those attackers as terrorists before the United States did, and it did warn the united states about that. The funny thing is that American people were considering them as innocent. After that all, why don't we, as Saudis, deserve to get this pass ? What did we do to be punished ? what was our fault ? Most of the hijakers on 911 were Saudis! Considering the ties between the Bush family and Bin Laden Construction, as well as Bandar Bush, even allowing members of the Bin Laden family to fly out right after 911 when all planes were grounded, THIS DOES NOT COME AS ANY SURPRISE! Some gready American will benefit financially, by this. What in H is the United States coming to I do believe our Pres. has something if not a lot, to do with this. . This article is designed to mislead! What kind of crap reporting is this? The picture shows a TICKET COUNTER line and implies that any one in this program bypasses security. The problem is that this program is for ARRIVALS. Everyone has to go through security. If you are a member of this program, you STILL go through security screening when you depart your country. To become a member, you have to have a background check and then you are able to enter a member country by scanning your fingerprints and your passport card. Then you may bypass the customs lines in member countries. This is not unlike the program the EU has, but in the EU, there is no background check, no application process, and no fingerprinting. Are you really that desperate for readers that you have to resort to making up facts? DHS must be dismantled ,defunded, Janet Napalitano is not mentally stable. Obama is also unfit mentally. You see they are about the worst possible desicions that are made over and over. They wont answer congress why they need a massive armor artillery build up. But we dont need them to tell us to figure it out. DHS plans to destroy you.